Brandon Kyle Weeden (born October 14, 1983) is an American football quarterback who is currently a free agent. He played college football for the Oklahoma State Cowboys and was drafted as the 22nd overall pick in the 2012 NFL Draft by the Cleveland Browns. He has also played for the Dallas Cowboys, Tennessee Titans, and Houston Texans. Weeden was the starting quarterback at Edmond Santa Fe High School, where he led the team to a victory in the state semifinals and was named team MVP and offensive player of the year. He finished 2nd in the state of Oklahoma in passing yards with 2,863 and accounted for 25 touchdowns. He was named All-State in football and later that year was also named All-State in baseball. 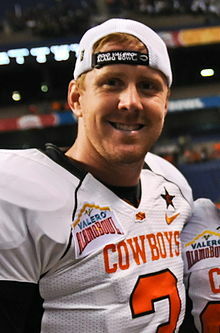 Weeden graduated from Edmond Santa Fe High School in 2002. A pitcher, Weeden was drafted in the second round of the 2002 Major League Baseball Draft by the New York Yankees as their first selection in the draft. After the 2003 season, he was traded to the Los Angeles Dodgers with Jeff Weaver and Yhency Brazobán for Kevin Brown. Following the 2005 season, he was selected in the Rule 5 draft by the Kansas City Royals. Weeden played his last season of professional baseball in 2006 with the Class-A High Desert Mavericks of the California League. Injuries and poor performance led Weeden to quit baseball. Weeden enrolled at Oklahoma State in 2007 and redshirted his first year. The following year, in 2008, he appeared in only one game against Missouri State. Starting in 2009, Weeden played in three games, including one in the absence of injured Zac Robinson on Nov. 19. Alex Cate started the game, but Weeden replaced him at halftime and led the Cowboys to an 11-point comeback victory, 31–28, over Colorado in the nationally televised Thursday night game. In 2010, Weeden was named the starter for the Oklahoma State Cowboys. In Week 2, Weeden suffered a severe injury to his thumb, which led to two interceptions and two fumbles in a win over Troy. Weeden said, "Hurt thumb, no thumb, whatever, it doesn't matter. I don't care if I don't have a thumb. You've got to take the snaps." He followed that performance by throwing six touchdowns the following week. He was named Big-12 Offensive Player of the Week in the victory over Tulsa. The win helped move Oklahoma State into the Coaches' Poll top 25 for the first time in 2010. Coach Gundy reflected on the win: "Sometimes, you have games like that. We were rolling on all cylinders." Weeden added, "We had a great week of practice. ... It was a whole lot of fun tonight." "Such a big deal has been made of my age. I use it to my advantage. I think it's a positive this year. I think it's a positive for my future. It's one of those deals, the way I look at it is, name one person who wouldn’t want to be in the position I am, and have the kind of path I’ve had?" In his senior season, 2011, he led Oklahoma State to an 11–1 regular season, a number 3 ranking in the BCS standings, and a berth in the 2012 BCS Tostitos Fiesta Bowl. He also broke school records in total attempts, completions, yardage, and touchdowns (all which were previously held by incumbent Coach Mike Gundy). In 12 games, Weeden completed 379 of 522 passes for 4,328 yards. In the 2012 Fiesta Bowl, the last game of his college football career, Weeden threw for 399 yards, completed 29 of 42 passes, and had 4 touchdowns (3 passing, 1 rushing) along with one interception in a 41–38 win against the Stanford Cardinal. Weeden set numerous records for passing, and offensive performance at Oklahoma State University, many of which surpassed records set by his college coach, Mike Gundy, when Gundy was a player. Weeden was drafted by the Cleveland Browns with the 22nd pick in the 2012 NFL Draft; he became the oldest player ever taken in the first round, at 28 years old. Going into the 2012 regular season, the Browns named Weeden their starting quarterback. In his first game, Weeden had a 5.1 passer rating after throwing four interceptions in a loss to the Philadelphia Eagles, which is the sixth lowest in a season opener by any quarterback attempting at least 15 passes since the merger in 1970. However, one week later, he was much improved throwing for 2 touchdowns, completed 26 passes on 37 attempts for 322 yards, no interceptions with a passer rating of 114.9. During Week 6, Weeden celebrated his 29th birthday by completing 17 passes on 29 attempts for 231 yards and 2 touchdowns en route to his first NFL win by defeating the intrastate rival Cincinnati Bengals. In the Browns victory over the Pittsburgh Steelers in Week 12, Weeden's helmet collided with Joe Thomas' knee, giving him a concussion. Weeden practiced three days later, and played the following week against the Oakland Raiders. Weeden threw for 3,385 yards. Weeden won the starting job for the 2013 season. Weeden injured his thumb in the fourth quarter of Week 2 in a 14–6 loss at Baltimore. He smashed his thumb on the helmet of left guard John Greco while throwing a pass and had to leave the game for treatment and X-rays. Backup Jason Campbell played the Browns' final offensive series as they dropped to 0–2. The Browns won their first game of the season under 3rd string quarterback Brian Hoyer, with Weeden sitting with a thumb injury. The following week it was announced Weeden would again sit for Week 4, giving Hoyer another start. On September 28, Weeden admitted that he was not guaranteed to reclaim the starting quarterback position over Hoyer when he returned from injury. The next day the Browns again won under Hoyer, leaving Weeden's status on the team in question. The next day, on September 30, it was announced Weeden would again sit in favor of Hoyer. However, the Browns had still not named who their permanent starter would be going forward. On Thursday Night Football vs the Buffalo Bills, Hoyer went down during the game and was replaced by Weeden. Weeden was able to guide the Browns to their third straight victory as they won, 37–24, over the Bills. The next day on October 4, it was announced that Hoyer would miss the rest of the 2013 regular season with a torn ACL. Despite the injury to Hoyer, Weeden was not guaranteed to reclaim the starting quarterback position. Later in the week, it was announced Weeden would start Week 6 for the Browns, and would remain the starter for the future if his play didn't begin to regress. In his Week 6 start, Weeden completed 26 of 43 passes for 292 yards, 2 touchdowns, and 2 interceptions in a 31–17 loss to the Detroit Lions, leading head coach Rob Chudzinski to declare that the Browns would stick with Weeden as the starting quarterback. Weeden put out another poor performance Week 7 vs the Green Bay Packers, completing only 17 of 42 passes for 149 yards, 1 touchdown, and 1 interception in a 31–13 loss to the Packers. On October 23, Weeden was once again benched, this time in favor of Campbell, for the Browns' Week 8 matchup vs. the 7–0 Kansas City Chiefs. On March 12, 2014, the Browns released Weeden after two seasons with the team. The Dallas Cowboys signed Weeden to a two-year contract on March 17. He was promoted to the backup quarterback position after the Cowboys waived Kyle Orton on July 15. Following a Week 8 back injury to Tony Romo, Weeden was named the starter in a 28–17 loss against the playoff bound Arizona Cardinals. He also closed out wins against Jacksonville, Indianapolis and Washington. Weeden began the season again as Romo's backup. During a Week 2 game against the Eagles, Romo fractured his clavicle and Weeden closed out the win. It was announced that Romo would be placed on short term IR, which left him designated to return November 22, and that Weeden would be the starter at quarterback. Even though he was preparing to be the starter, with owner Jerry Jones and head coach Jason Garrett commenting on his positive progress, the Cowboys covered themselves by also trading for Matt Cassel on September 22. Weeden started three games, completing 71 percent of his attempts for 666 yards and one touchdown with two interceptions, but lost all three games. On October 13, the Cowboys decided to bench him and instead play Cassel, who started four games (all losses). On November 17, he was waived to make room for Romo, with the team deciding to keep Cassel as the main backup. Weeden was claimed off waivers by the Houston Texans on November 18. He debuted with the team in a game against the Indianapolis Colts on December 20, leading the Texans to their first-ever victory in Indianapolis after starting quarterback T. J. Yates was injured. On December 27, Weeden made his first start with the Texans against the Tennessee Titans. He was 15–24 for 200 yards and 2 touchdowns, while also rushing for 11 yards and another score as the Texans won by a score of 34–6. The next week he returned to a backup role after Brian Hoyer (concussion) was cleared to play. Weeden was also Hoyer's backup for the Texans' 30–0 playoff loss to the Kansas City Chiefs. On April 1, 2016, Weeden re-signed with the Texans on a two-year, $4 million contract. He spent the 2016 season as the third-string quarterback behind a combination of Brock Osweiler and Tom Savage. Weeden did not appear in a game in 2016. He was Osweiler's backup for the playoff win against the Oakland Raiders. On September 2, 2017, Weeden was released by the Texans. On October 3, 2017, Weeden signed with the Tennessee Titans. He was only active for one game with the team. He became a free agent after the season. On March 27, 2018, Weeden signed with the Houston Texans. He was the backup to Deshaun Watson for 2018, appearing in only one game for one play. In the summer of 2009, he married Melanie Meuser. They have a son named Cooper. On March 3, 2016, Weeden, Dan Bailey, and Dez Bryant unveiled the new Oklahoma State football team uniforms. ^ Feinsand, Mark. RHP Weeden is Yanks' first pick Archived January 10, 2012, at the Wayback Machine. MLB.com. June 4, 2002. Retrieved November 12, 2011. ^ Silver, Michael. Brandon Weeden's long, strange trip from minor league baseball leads him to NFL. Yahoo! Sports. April 23, 2012. Retrieved April 23, 2012. ^ "Oklahoma State, Retrieved September 20, 2010". Okstate.com. September 19, 2010. Retrieved October 28, 2011. ^ "ESPN.com, Weeden not making excuses". Sports.espn.go.com. September 16, 2010. Retrieved September 20, 2010. ^ "The Oklahoman". Newsok.com. September 20, 2010. Retrieved September 20, 2010. ^ Spousta, Tom (October 14, 2011). "A Top Quarterback Teased for Being 28". The New York Times. Retrieved October 8, 2011. ^ Brandon Weeden Draft Profile. NFL.com. Retrieved May 10, 2012. ^ Lubinger, Bill. From baseball to Berea, tracing the new Age of Brandon Weeden with the Cleveland Browns. The Plain Dealer. May 5, 2012. Retrieved May 23, 2012. ^ Hanzus, Dan (August 6, 2012). "Brandon Weeden named Cleveland Browns starter". National Football League. Retrieved December 22, 2012. ^ "Browns still back Brandon Weeden". ESPN. September 11, 2012. Retrieved December 22, 2012. ^ "Browns top Bengals for 1st win". Fox News. October 15, 2012. Retrieved December 22, 2012. ^ Alper, Joe (November 25, 2012). "Brandon Weeden suffered a concussion". Profootballtalk.com. Retrieved December 22, 2012. ^ Andersen, David (November 28, 2012). "Cleveland Browns Brandon Weeden back at practice after concussion against Steelers (video)". The Plain Dealer. Retrieved December 22, 2012. ^ "Browns cut QBs Weeden, Campbell". ESPN.com. March 12, 2014. ^ Hanzus, Dan (March 17, 2014). "Brandon Weeden, Dallas Cowboys sign 2-year contract". NFL.com. Retrieved March 17, 2014. ^ "Cardinals roll over Romo-less Cowboys". NFL.com. The Associated Press. Retrieved November 4, 2014. ^ Hanzus, Dan (November 17, 2015). "Brandon Weeden released by Dallas Cowboys". NFL.com. Retrieved November 17, 2015. ^ Pelissero, Tom. "Texans claim Brandon Weeden off waivers". USA Today. Retrieved November 19, 2015. ^ "Brandon Weeden: Game Logs at NFL.com". www.nfl.com. Retrieved March 4, 2016. ^ Ganguli, Tania (April 1, 2016). "Texans re-sign QB Brandon Weeden". ESPN.com. Retrieved April 6, 2016. ^ Sidhu, Deepi (January 4, 2017). "Tom Savage OUT vs. Raiders". HoustonTexans.com. Retrieved January 5, 2017. ^ Barshop, Sarah (January 8, 2017). "Brock Osweiler will remain starting quarterback for Texans". espn.com. Retrieved January 8, 2017. ^ "Transactions: Texans down to 53-man roster". HoustonTexans.com. September 2, 2017. Archived from the original on January 8, 2018. ^ Wyatt, Jim (October 3, 2017). "Titans Add Free Agent QB Brandon Weeden". TitansOnline.com. ^ Gantt, Darin (March 27, 2018). "Texans sign quarterback Brandon Weeden". ProFootballTalk.NBCSports.com. ^ "Melanie Dawn Meuser and Brandon Kyle Weeden". Edmond Sun. June 10, 2009. Archived from the original on October 28, 2014. Retrieved October 28, 2014. ^ Price, Jacob. "Brandon Weeden's true calling is as an Oklahoma State jersey model". SBNation.com. Retrieved March 4, 2016. Wikimedia Commons has media related to Brandon Weeden.